Samuel BYRSKOG, Story as History – History as Story. The Gospel Tradition in the Context of Ancient Oral History, Boston/Leiden, Brill, 20022. 22,7 cm. xix-386 p. ISBN 0391041665. $ 39. 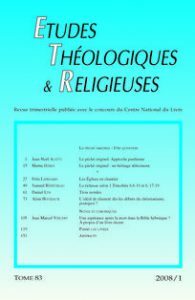 Gerd, THEISSEN, Le mouvement de Jésus. Histoire sociale d’une révolution des valeurs, traduit par Joseph Hoffman, Paris, Cerf, coll. « Initiations », 2006. 23 cm. 347 p. ISBN 2-204-08043-8. € 35. Delbert BURKETT, Rethinking the Gospel Sources. From Proto-Mark to Mark, Londres, T&T Clark, 2004. 23 cm. 290 p. ISBN 0-567-02550-0. £ 19,99. David PASTORELLI, Le Paraclet dans le corpus johannique, Berlin/New York, Walter de Gruyter, coll. « BZNW 142 », 2006. 23 cm. xii-343 p. ISBN 3-11-019045-1. € 98.